In Constitutional Law, we discuss the basic rules of the U.S. Constitution commonly examined in law school and tested on the bar exam. To help you truly learn and memorize Constitutional Law, our professional narrator uses modern, easy-to-understand language that organizes the topics in a way that simply makes sense. In Constitutional Law, we break down the significant Clauses, Articles, and Amendments within the Constitution and discuss their elements in detail. We examine the many landmark Supreme Court cases that have provided different interpretations of the Constitution over time. And we present real-life examples to demonstrate how the Constitution applies to hypothetical fact patterns. 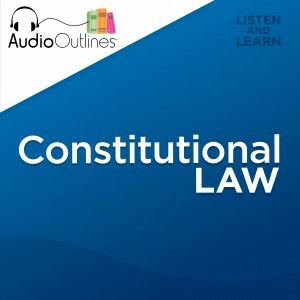 AudioOutlines – Constitutional Law serves as an extremely simplistic law school supplement and bar exam review rolled into one audio study guide – a must-listen for all 1L law students and anyone preparing for the bar exam.